When people think of Pinterest, it often drums up ideas of stay-at-home moms pinning recipes and birthday ideas for their children. But in reality, Pinterest is a huge search engine that business owners can use to drive targeted traffic and grow their email list. In fact, it’s considered by some as the second largest search engine after Google. Are you taking advantage of this massive platform to grow your email list with targeted visitors? In this post, you’ll learn 7 proven steps you need to take to start using Pinterest and see your numbers soar. Pinterest has been around for a while, but it’s still not widely used by many people – especially marketers, men and small businesses. Everyone knows about Facebook, and you’re right if you think this platform is the primary leader in driving social traffic. But, Pinterest is just as popular as Instagram or Twitter, making it a social platform you should pay attention to. And if you use Pinterest effectively, you can bring in three times more traffic than Twitter, StumbleUpon, Reddit, LinkedIn, Google Plus and YouTube combined. 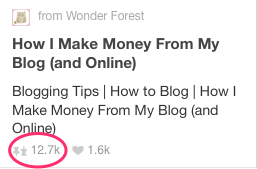 Within four months of starting a new blog, Pinterest is my number one source of traffic by a long shot. And these people didn’t visit once and leave forever. When visitors come to your blog from Pinterest they are already primed to want to get to know you, so I was able to capture targeted visitors with my content upgrades and grow my list easily. Are you ready to learn how to capture the attention of Pinterest visitors and convince them that your brand is the one to follow? It all starts with your blog. Take a look at your website and see if you can immediately tell what the main theme – or “niche” – is. If it’s not obvious to you right off the bat, then it isn’t to your visitors either. When someone on Pinterest clicks on your pin and visits your post, if it’s well-written and useful they’ll stick around and see if you have other great content on a similar topic. But they have to immediately understand what your niche is if you want to have any hope of capturing and retaining their interest. When looking at your niche, decide if you want to focus on one core topic, or if you want to focus on one core demographic. For example, Neil Patel’s site, Quick Sprout, caters to a demographic range of small business owners and marketers – and even freelancers. 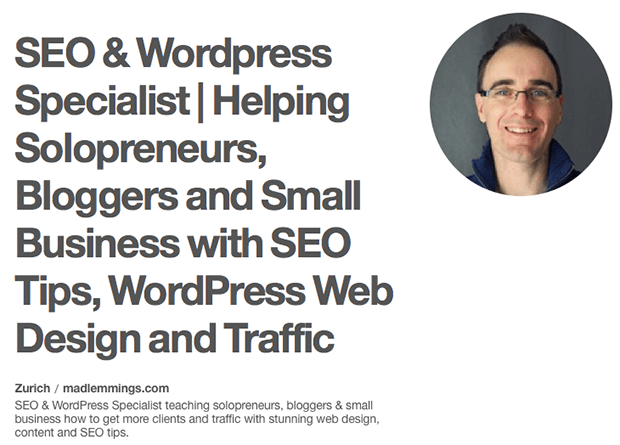 His blog topics range from SEO tips to writing tips to email marketing tips. On the other hand, Social Media Examiner focuses solely on providing the best social media marketing tips around. There’s no mistaking their niche when you look at their blog. Your site name can tell visitors a lot about your niche. For example, Jon Morrow’s site name says it all: Smart Blogger. You can be confident that when you visit his site, his content will help bloggers blog smarter. But what if your site name has nothing to do with your niche? This happens a lot. The next two key identifiers will tackle this conundrum. What happens if your site name is your own personal name? How do you let visitors know who you are, and more importantly, what you blog about? To set up your site title and tagline in WordPress, go to Settings » General. Pinners typically arrive on your site via a pinned blog post, a page, an opt-in form or your lead magnet. To help them quickly identify what your blog is about, consider using a tagline in your logo if your site name doesn’t clearly identify your niche. One of the best ways to capture your Pinterest visitors is with an irresistible offering called a lead magnet. A lead magnet is an opt-in bribe that visitors receive in exchange for their email address, and it’s extremely valuable to your target audience. Your free offer will typically help them solve a problem that they are craving to know more about. And when you use a dedicated landing page, it can be highly effective in converting your visitors into subscribers. For example, Lizzie from October June, tripled her email subscribers in one day by using a landing page. If you want your offer to be highly effective, you need to define the problem your target audience has and position your opt-in bribe as the solution to that problem. Henneke Duistermaat, a copywriter and marketer, does an excellent job at attracting readers to her site by offering an email course to help improve people’s writing chops. It’s true – having someone smiling on your landing page will boost conversion rates. In an A/B split test, when visitors were greeted with someone smiling versus someone serious, profits of a software product increased by 10.7% over five weeks. And if you’re trying to build your brand, loyalty, and trust, it’s always a good thing to have your face displayed on your landing page, but it’s especially important when using Pinterest. Here’s Melyssa Griffin’s landing page for her free 21-day challenge, which she promotes on Pinterest. One quick way to generate more subscribers, traffic and saves on Pinterest is to create more landing pages. But this means having more opt-in bribes on your site. 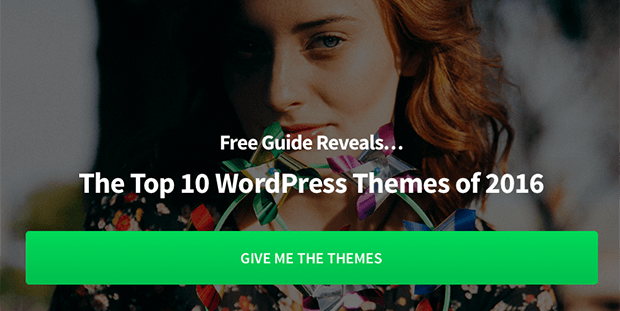 And she also has a dedicated landing page for her guide on the Top 10 WordPress Themes of 2016. This gives her more opportunities to promote her lead magnets on Pinterest. If there’s one thing you can do to increase your conversions, it’s offering social proof on your landing page. 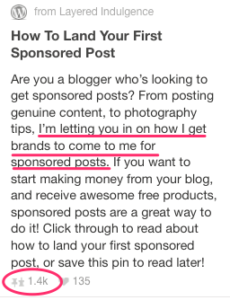 When someone lands on your free opt-in bribe from Pinterest, if they don’t know you or your blog, you can help boost their trust level by showcasing testimonials. This helps visitors realize how valuable your offer is and it totally helps with converting new visitors. Here’s Suzi Whitford’s dedicated landing page for her Facebook Promo list where she’s added testimonials from her subscribers. 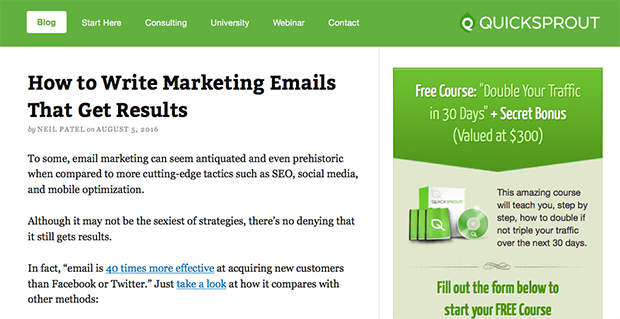 Not only are lead magnets a great way to generate more subscribers, but using content upgrades can also skyrocket your email list. A content upgrade is a post-specific bribe that’s related to the post’s content. Content upgrades are the most effective way to grow your email list using Pinterest because, most of the time, Pinterest users arrive at your site via a blog post. 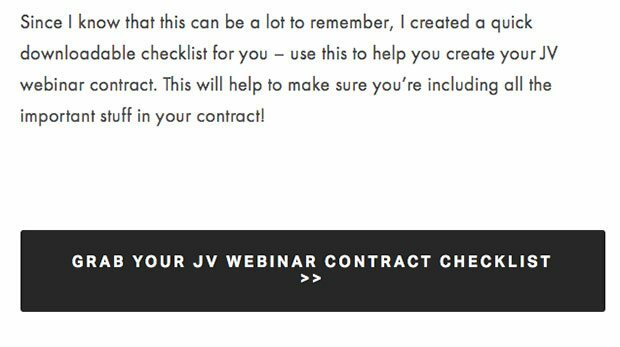 If you’re reading that post, then you’re interested in how to do joint venture webinars the right way and this checklist would be very useful to you. The likelihood of you grabbing that checklist is much higher than if there was an optin box offering a guide to email list strategies, as that would be unrelated to the post’s content. When I started my new blog, Twins Mommy, four months ago, I didn’t have a lead magnet, mostly because I didn’t know what my target audience was craving. So, I decided to do content upgrades to grow my email list and within four months, I have over 1,000 subscribers. Most of these subscribers came from Pinterest, and I have a high conversion rate for each of my content upgrades because my target audience of mom bloggers and entrepreneurs were on Pinterest. There are several ways to grow your email list using Pinterest, but it all starts with an optimized profile. First, you’ll want to sign up for a Business account with Pinterest. Next, you’ll fill out your business name and bio. Use keywords in your name and bio so that when pinners are searching on Pinterest, your name will show up on the results page. Decide on the title you want to have next to your name or business name. Incorporate keywords that you know pinners will use to search for you. For example, Ashley Faulkes of Mad Lemmings uses the keywords that describe exactly what type of business he’s in. But how do you turn visitors to your profile page into subscribers? The trick is to promote your lead magnet in your bio. Pinterest doesn’t use live links, but that doesn’t stop people from using this strategy – probably because it’s highly effective. Melyssa Griffin has over 60,000 email subscribers, and part of her success is from promoting her lead magnets in her Pinterest bio. Your pins have the capacity to reach hundreds, even thousands of pinners. 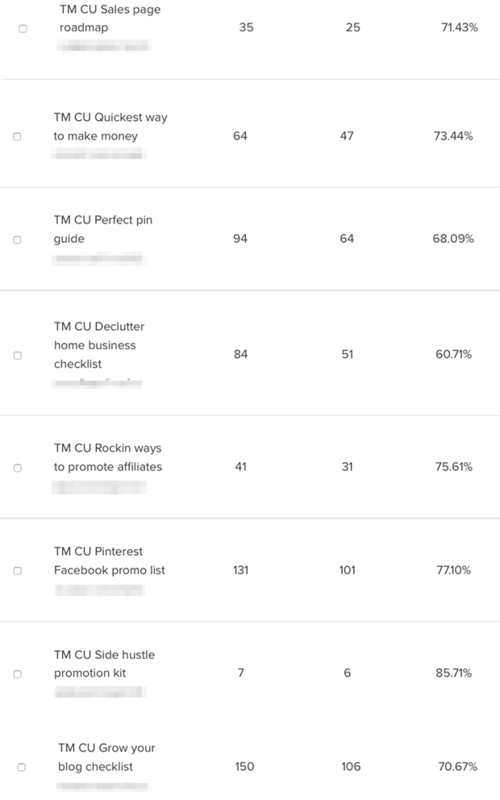 An easy way to turn a percentage of these pinners into subscribers is to incentivize your pin. 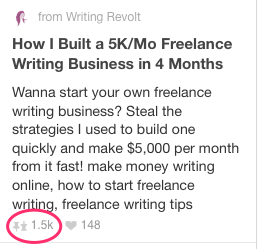 This means showing pinners that your pin leads to more than just a blog post; it’s packed with added value. There are two ways you can do this: by making a pin for your lead magnet, and by adding a graphic of your content upgrade onto your pin image. Remember we talked about having multiple landing pages? This is so you can pin your lead magnets all over Pinterest. For example, Christina of Embracing Simple has a popular pin – with over 2k saves – that leads to her free course page on simplifying your life. For the pin description, you’ll quickly notice that pins with high saves are the ones that are personal and focus on the blogger’s successes (and how you can achieve the same success too). A very popular way to generate more subscribers using Pinterest is to create a graphic of your content upgrade and add it to your pin. People like to see what they are getting, even if it’s just a checklist or a worksheet. For example, Northern Belle Diaries has a pin with over 7k saves, and the great thing about this pin is that it tells pinners that the post comes with a bonus income tracker. When people see what they are going to get, it primes them to sign up to your list and grab that freebie. The best part of being on Pinterest is the opportunity to join group boards in your niche. Group boards have the potential to expand your reach and have your pins seen by thousands of pinners. Another benefit to being on many group boards is the ability to pin often in a day. While there is no right or wrong answer to how many pins you should pin per day, you can start with 5 pins a day and work your way up to 30 or more pins a day. How do you find group boards in your niche? The easiest way is to look at another blogger’s Pinterest profile who’s in a similar niche and see what group boards they belong to. You can also search on a Pinterest group board directory, like PinGroupie, to find a group board. If the group board owner wants pinners to email them, include your Pinterest profile URL, the email address associated with your Pinterest account and your website. A group board owner needs your email address to invite you and will want to view your profile and site to get an idea of your influence and niche topic. Other group board owners may request that you comment on one of their recent pins to request to join their group board. When you find one of their pins, click on it and below the pin image, you can click on comments and request to join. For most bloggers and entrepreneurs, promoting content on Pinterest or any other social media platform takes up a lot of time. While you can delegate this task to a virtual assistant or social media marketing manager, if you’re bootstrapping your business or you have a hard time letting go of control, it’s time to invest in an automation tool. By using a tool to do all your pinning, you can save time and not have to worry about being online 24/7 to keep your account active and hitting those optimal pinning windows for your audience. And when your pinning is on autopilot, the effort you put into your blog to set up your opt-in bribes and incentivized pins will help drive traffic to your site and ultimately generate more email subscribers. This entire Pinterest list-building strategy boils down to two things: optimizing your website for Pinterest traffic, and optimizing your Pinterest profile/pins for email optins. A solid niche. When visitors come to your blog, they want to see related content. People visit probably ten or more blogs a day and, if you want yours to stand out, your content needs to speak to them. A niche can help you do that. Dedicated landing pages to collect email leads from Pinterest. Having multiple landing pages for your lead magnets not only makes it easy for your visitors to subscribe, but it also gives you more opportunities to promote your lead magnets on Pinterest and other social media platforms. Content upgrades. Content upgrades are important because Pinterest traffic typically goes to your blog, and with content upgrades you can really pinpoint your target audience’s struggles and convert a higher percentage of readers. Use keywords in your descriptions (remember, Pinterest is a search engine). You’ll also want to promote your lead magnet in your bio. Incentivize your pins. This means creating a pin for your lead magnets and adding a graphic of your content upgrades to your pins. Pin your content on group boards. These have the furthest reach, and can get your pins in front of thousands of people every day. Invest in an automation tool like Tailwind to do your pinning for you. By pinning your lead magnet and content upgrades every day, you’ll increase the number of people you reach, and increase your email subscribers. There you go! 7 proven steps to help you grow your email list with Pinterest. Are you using Pinterest? Tell us how you convert pinners into subscribers in the comments! So happy you found this useful. Using Pinterest as part of your marketing strategy is a great way, but yea, finding that info online can be a challenge. Have fun optimizing your blog and Pinterest profile for more subscribers! I love, love this article… but I find it very odd that an article about how Pinterest drives traffic lacks any “Pin” buttons (e.g. floating share buttons, or a Pinterest option in the “Share” section) or even a pinnable image for my browser extension. I wanted to save it to my Pinterest board… what the what? LOL!! Haha! You are very observant, Emily. 🙂 The reason we aren’t so focused on Pinterest like other blogs is because our audience isn’t primarily on Pinterest. As with any social media strategy, you should choose the platforms where your audience is hanging out. However, our audience HAS audiences on Pinterest, thus the reason for this article. Hope that makes sense! Thanks so much chica! Glad you enjoyed this post here.